The Impact Soft and Natural 4-Socket 3-Light Kit was put together to help image makers who need a lightweight setup for a wide variety of subjects. The three included Impact 4-Socket Fluorescent Fixtures accept lamps up to 50W and have built-in tilting brackets and 5/8" receivers for the included 6.0' light stands. Instead of a speed ring, these lights have four receptacles around the head that accept the poles from the included 20 x 27.5" softboxes. The kit includes 12 digital-friendly CFL fluorescent lamps with E26 screw-in bases and a daylight temperature of 5000K. It all fits in the provided nylon carry bag. The 4 Socket Fluorescent Fixture from Impact is a lightweight fixture in a polycarbonate housing that accepts Edison-base compact fluorescent lamps up to 50W, for a four-socket total of 200W. The fixture's bracket tilts and locks into position and features a standard 5/8" receiver that mounts on any 5/8" stud or accessory, and also accepts standard photo umbrellas. The 50 x 70 cm Softbox for Fluorescent Fixtures by Impact is a light modifier that softens the output from Impact FF-S1 and FF-S4 single- and four-socket fluorescent fixtures, as well as Impact's SF-ABRL160 Slave Flash. Installation is easy - no speed ring is needed; each of these heads has four receptacles located around the face of the fixture. The softbox can be used with up to four 50W fluorescent lamps for a total of 200W. The Eiko SP27/50K Spiral Fluorescent lamp (26/120V) is an Edison base (E26) screw-in bulb, for the SP Systems Cool Light, Interfit, Impact, Bowens Tri-Lite, or any other floodlight fixture that can accept a large bulb. The lamp has a color temperature of 5000° and an average life of 10,000 hours. This lamp is not for use with dimmers, electronic timers, photocells, totally enclosed fixtures, motion/occupancy sensors, or where directly exposed to water. Box Dimensions (LxWxH) 8.45 x 7.65 x 6.15"
Box Dimensions (LxWxH) 19.85 x 8.4 x 1.5"
Box Dimensions (LxWxH) 5.6 x 2.45 x 2.35"
Soft and Natural 4-Socket 3-Light Kit is rated 4.1 out of 5 by 33. Rated 2 out of 5 by MSD from The Bottom Line Purchased this for use on a short film project. The kit did not fit our needs because the included lightbulbs are not bright enough (on their own) for indoor three point lighting. You're just going to have to break the bank or DIY for quality lighting. The lamp heads will produce an adequate amount of light when refitted with higher lumens/wattage bulb. The stands are flimsy but moderately stable. I've used the lamps successfully with still backlighting and fills, but the pitfall of this product is that it is not suitable for key lighting. The bottom line is that the price tag is too high for the power. Save your money for bigger and better. Rated 4 out of 5 by MT photog from Love this kit! The kit provides really good lighting for portrait shoots and the bag it comes with is great. I do wish the bag had slots for the bulbs because you have to remove the bulbs to take the softbox off. Also, setting this kit up isn't exactly easy but the results are worth it. I received this package with two of the bulbs broken but thanks to BHphoto's customer service they are sending me new bulbs with no extra charge. All in all, this is a great buy! Rated 5 out of 5 by DadOZach from After a year of use at work I bought one for myself. I like my Impact 3-light kit very much. I purchased one set for work about a year ago and don't tend to take them apart and put them together again and they are in perfect condition. It was simple to assemble and not terribly expensive. The bulbs are the correct color temperature for skin tone and the type of work I do. My most recent purchase is a kit for home, which I will have to assemble and disassemble frequently as I don't have spare room to leave them setup. I treat my equipment well, so expect them to last, but the proof will be in the pudding. Much better than older Hot lights. Rated 3 out of 5 by Rich Ard from Great light but don't be in a hurry I bought this light kit about a month ago & have used it quite a lot. The setup is not convenient & takes time. I timed myself assembling the kit. It took me 20 minutes. This only includes the time for assembly. This does not include time for positioning the lights, taping extension cords to the floor or setting up lighting ratios. The soft boxes are not an umbrella style system where you can 'pop' them open. You have to assemble each one-by-one. The CRI on the bulbs are rated at 80 with a color temperature of 5000k. I don't know the lux or lumens for an assembled light. The light output is ok, but I wish it were stronger. If you buy this kit, keep the boxes & develop your strategy & method for packing it. I kept the boxes for the bulbs, and two of the boxes of the socket fixtures. I used the socket fixture boxes to pack the bulbs. I put one box on each side of the light kit bag & everything else in between. I even added a small extension cord & surge protector. Everything will fit in the bag, just take your time to figure out your packing strategy. I used the lights close to my subjects to predominately take head and 2/3 shots. Overall I bought on price & I'm happy with the lights. I wanted something portable & affordable. One more thing to keep in mind is your 'on location setup & breakdown' time. Rated 4 out of 5 by Audiotrax from Cheap and effective! I grabbed this light kit while it was in the Deal Zone. Glad I did! It has everything I need! I'll break down my thoughts: Quality For what you pay, it's pretty good. Everything is extremely light weight, but I feel as if it's at the cost of durability. I wouldn't say everything is flimsy, but I wouldn't consider taking it on the road day after day, setting it up and tearing it down. Something will break eventually. I bet it would survive occasional road-use, but if you're constantly setting up and tearing down, I'd look for something more heavy-duty. Ease of setup Setup was pretty easy. The only assembly required is for the soft boxes. I had a little trouble putting those together. To get the support rods in you have to put a little muscle into it and bend them. The rods are made of metal and somewhat flexible, even so, you feel like they might break if you bend too much. But I suppose that's true of anything you bend! Light quality No complaints here! 4 lights in each head for a total of 12 bulbs and they do a great job of throwing light and are well balanced. Plus, the soft boxes do a fine of job of diffusing. The only mishap I ran into is 3 of the bulbs I received didn't work. I contacted B&H customer service and new bulbs are on the way. That didn't ruin my experience. You buy bulbs long enough and you're sure to run into some that just don't work. Overall, a great kit for the casual or semi-pro user. I'll be using it mainly for video stuff in my home studio. Check out the picture attached to this review. Both photos were taken using the same settings on my webcam, one with just my ceiling light and the other with the light kit on. Note that I only used 2 lights for the photo since I'm still waiting on the bulbs for the 3rd light. Rated 5 out of 5 by Eric from Good kit! I got a good deal on this kit through B&H. I researched it a bit. The bulbs that come with the kit may not be bright enough for all occasions, but you can always put in brighter bulbs. The highest wattage bulbs available would be very bright, but would also be a considerable added expense. I've used it now for still photography and for video. I thought about getting the model with the dimmer which would have been very useful. But I considered my budget and am happy with my purchase. I got good sand bags as well, and six of the next voltage higher bulbs. Rated 5 out of 5 by Michelle M. from Great 3 point lighting kit for the money. I bought this 3 point lighting kit on a whim based on a B&H sale. I have a ton of lighting kits, from Arris to other inexpensive LED kits. This one works great for the money. 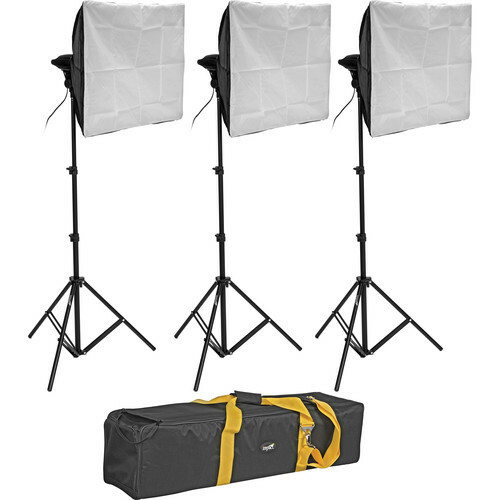 It comes in a pretty good carrying/storage bag, with 3 cheapie but reliable lighting stands. The softboxes aren't umbrella-type, quick set up softboxes. You have to take 3-5 minutes per light to set up the 4 metal rods and attach the softbox to the fixture, AND THEN you have to screw in each of the 4 light bulbs per fixture. So set up time, this is not the fastest kit. This also means you cannot store the lights with the bulbs installed (at least, not safely in the case it comes with). When done, you have to unscrew each bulb, and store the bulbs away in a container where they won't be easily broken, then break down the kit. That's packing up 12 light bulbs as part of your breakdown routine. If you're not looking for speed, or if you have the room to leave the softboxes assembled all the time, this kit will work great. If you're primarily concerned with set-up speed, this kit might not work. Although the included bulbs are great, I swapped them out for slightly more powerful ones with a slightly different color temperature (Alzo 27W, 5500k bulbs on @, 4 for $, bigger, brighter, warmer bulbs). I'm relatively new to video and lighting, but I bought this kit about five months ago when it was up for a one day sale here on B&amp;H. My question is, would I be able to connect a dimmer of some sort to this light and adjust the light output? I know you can do that for some lights, just not sure if that's something you can do with florescent lights and this fixture in particular. Thanks in advance. Could this be used to shoot a video interview in a small room with a DSLR? I want to make sure I have enough lighting for 24fps at 1/50th...? It doesn't have to have a lot of emotion or anything, just has to be well lit to look like quality recording. What are the dimensions of the bag, and how much does it weigh with everything in it? I am new to lighting set up, can I switch the bulb holders to hold flashes/sped light? If your question relates to re-dedicating the stand to hole another fixture , then the answer is yes. I don't have the gear handy to measure, but tripods/stands have various stud diameters and I'd look at the Impact product specification to get the size. From there, you can see if your fixture will mate onto that stud.If you look closely at the thumb nut on the bottom of the fixture, this is the means of tightening it onto the stud. Do the lights get hot? or are they cool bulbs? The bulbs are not extremely hot, but, like all light bulbs, they do put off heat. Hope this helps answer your question. Can the bulbs be illuminated individually? can you either switch off one or many bulbs or unscrew them so only 1 or two are on at a time? Although each socket cannot be switched on/off individually, you can remove as many bulbs as you wish and still operate the light. Personally, I switch between setups with two 64W CFL bulbs and two empty sockets, and setups with four 26W bulbs and both work perfectly (have been doing so for about a year). To make things even easier, the white section on the softboxes are removable, so switching out bulbs for a different color balance or different bulbs is easy. I hope that answers your question! Are these lights silent? What about after a year? I've worked with low-end flo kits that buzzed and I don't want to waste my money on buzzy lights.